The PCB for the workshop is 2 in x 2 in, please design your Wilkinson to match these dimensions. 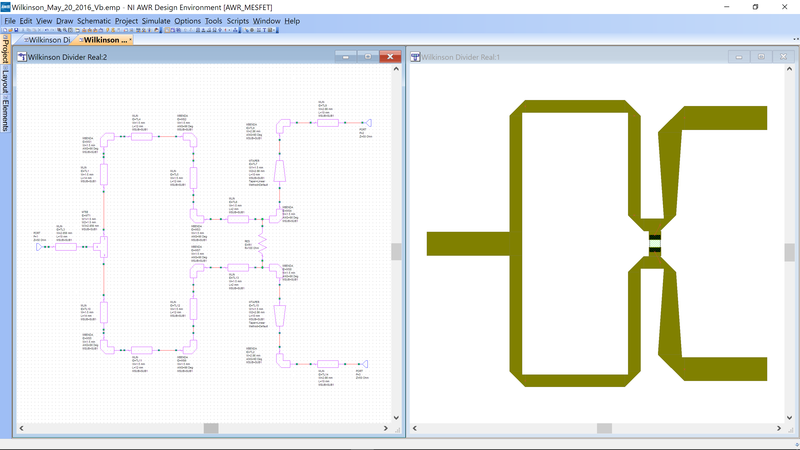 Creat a schematic and call it “Wilkinson ideal”, , Project -> Add Schematic. Add two TLIN elements, one RES and 3 ports. TLIN is an indeal transmission line specified by electrical length and impedance – it does not have a physical representation. Connect them as shown below and set Z=50Ohm, Z0=70.7Ohm, EL=90deg, R=100Ohm. Plot the magnitude of S11, S21 , and S31 in dB in Rectangular graph. 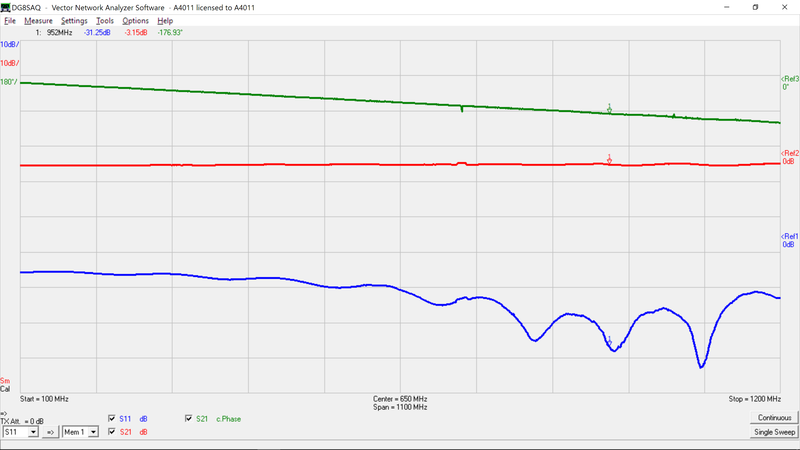 Add marker on S11 and S31 curves at 0.95GHz. It is very important to set the Dat Source Name as this tells which design to use. 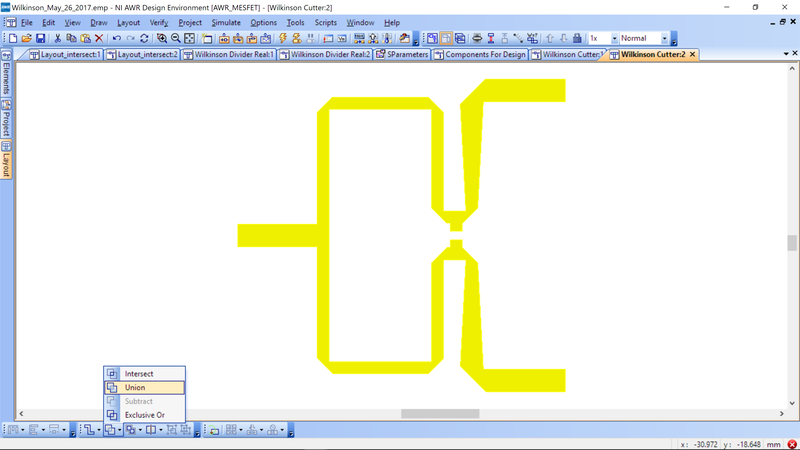 The template has many, so if you do not set it to your Wilkinson, it will simulate all designs in the template. Your simulation results should look similar (but not eactly) to the figure.. 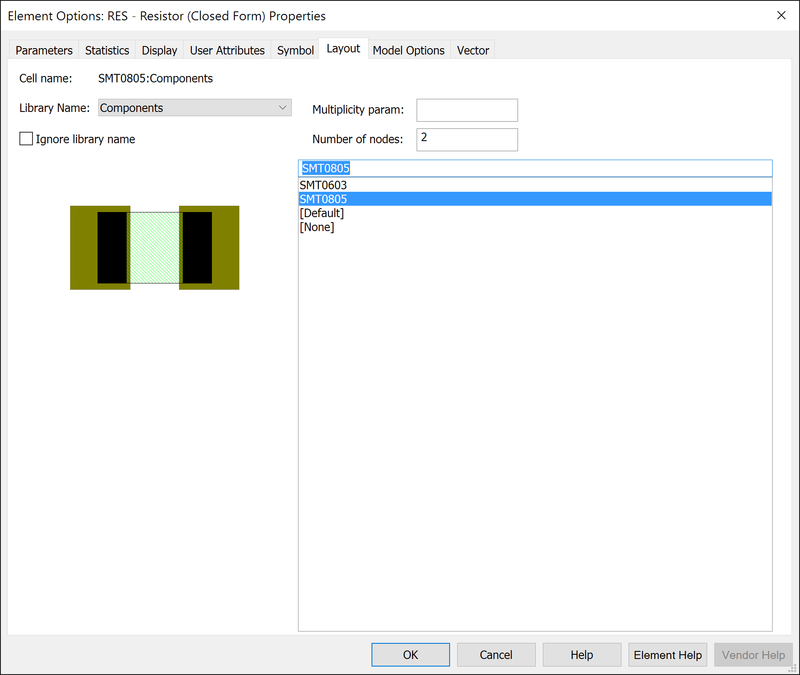 Create a new schematic and call it “Wilkinson real” and make the same wilkinson divider with MLIN models (in the Projects tab on the right, you can select the Wilkinson schematic and right mouse click and select Duplicate, then you can Rename). 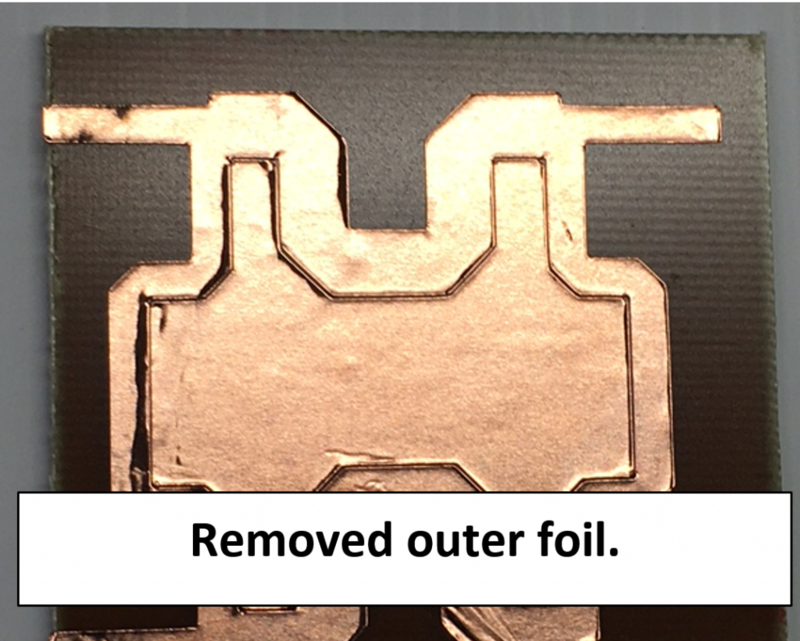 MLIN are transmission lines with a microstrip transmission line realization – the incorporate the non-idealities of a microstrip transmission line and depend on the specific stackup of your substrate. The stackup is contained in the MSUB from the Global Definitions has the correct information for our workshop. 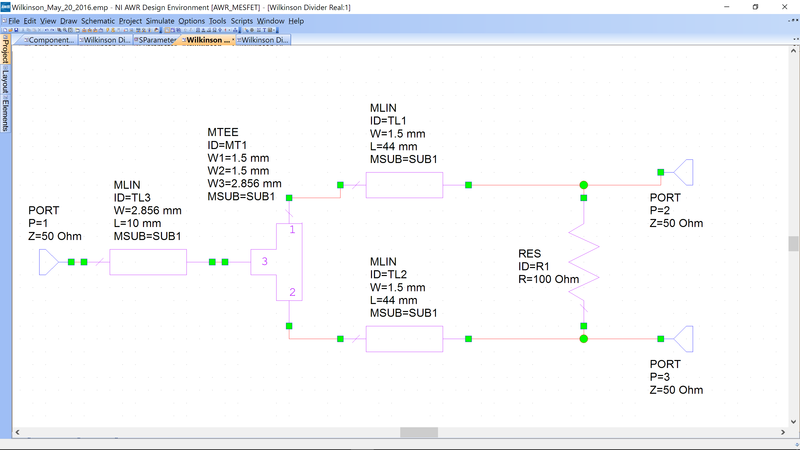 You should not add an MSUB to your schematic. 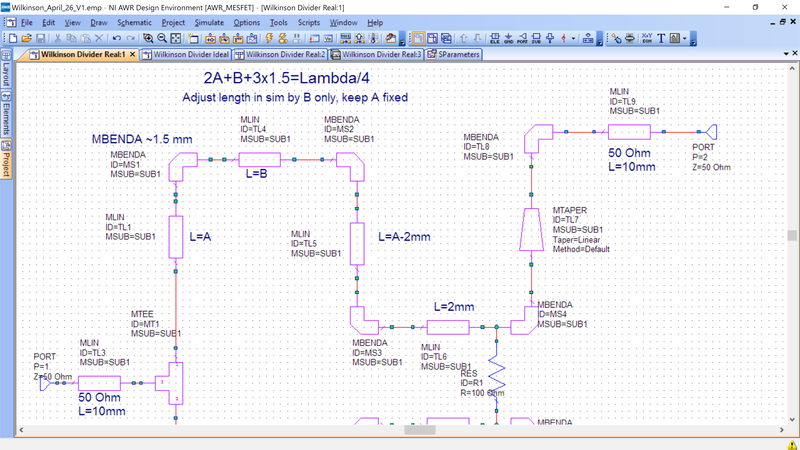 Determine the Width and Length of the transmission lines using TXLINE and bulid the real Wilkinson divider schematic. TXLINE can be found under Tools->TXLINE. It is a calculator to help you convert electrical parameters such as electrical length and impedance to a physical implementation. The following screen shot show the calculator interface. 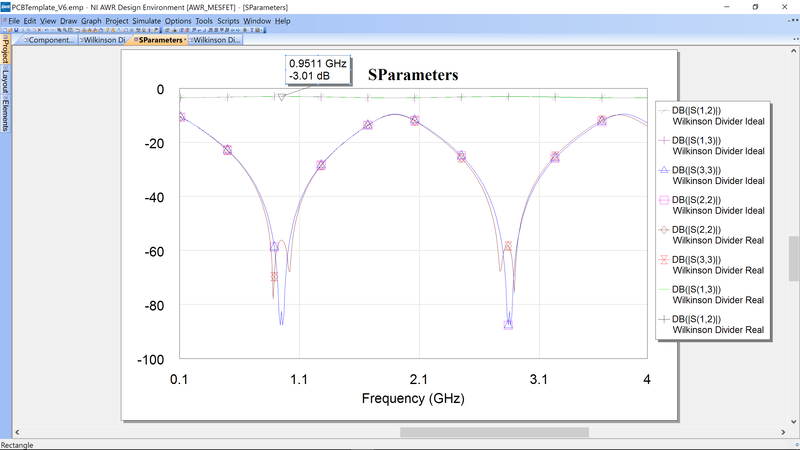 The picture shows a transmission line with a 70.7 Ohm impedance and an electrical length of 90 degrees at 950 MHz. 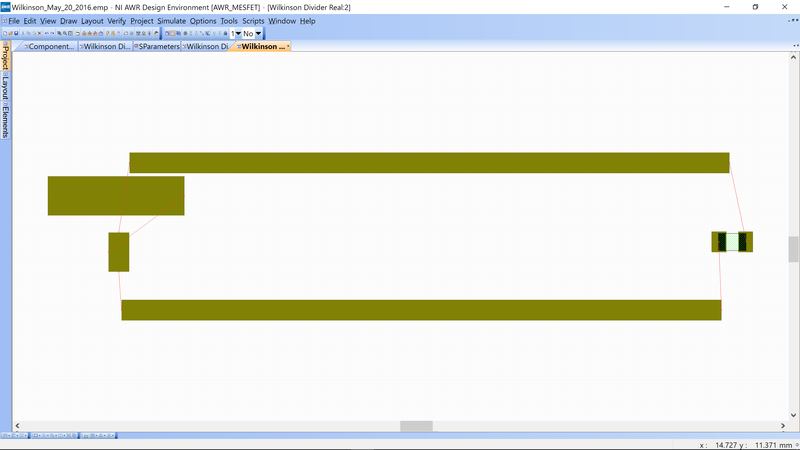 The calculator works bidirectional. 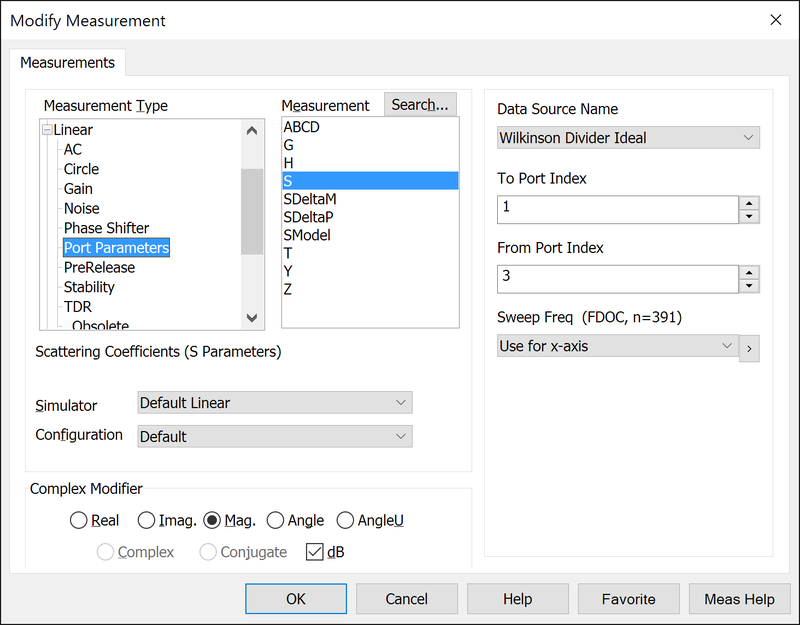 To find a transmission line from electrical length, insert all of the the parameters on the left. 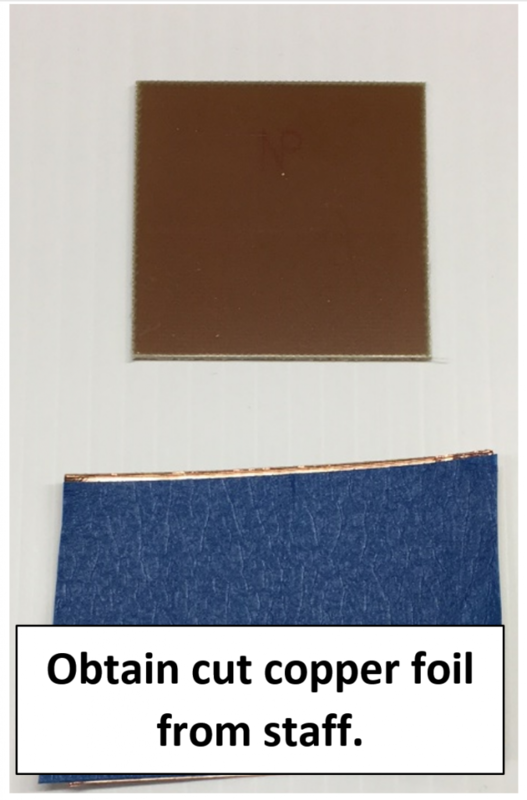 Also set Dielectric Constant=4.5, Loss Tangent=.005, Conductor=Copper, Height=1.53 mm, Thickness=18 um. 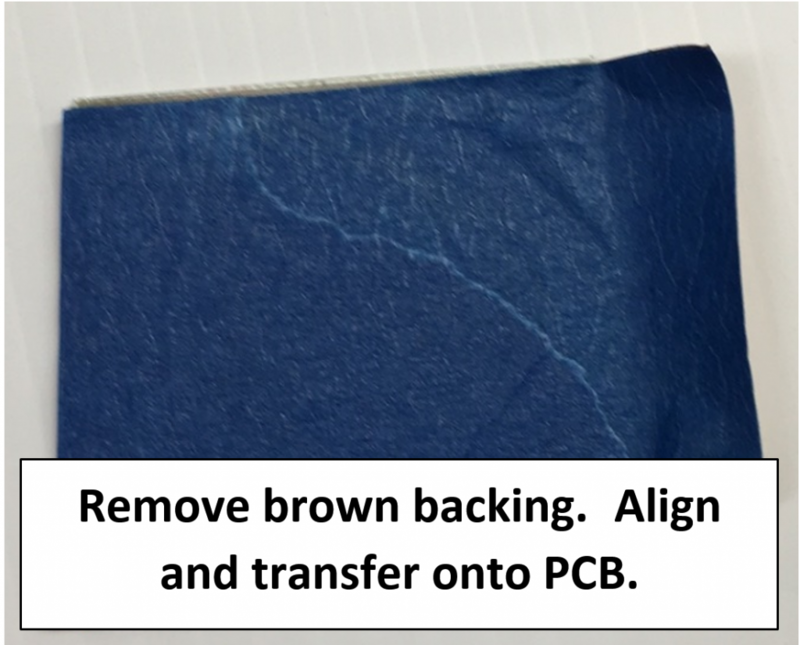 These are obtained from the PCB stackup we are using in the workshop. Note that the Height and Thickness are set on the right side, even though we are calculating from left to right in this example. 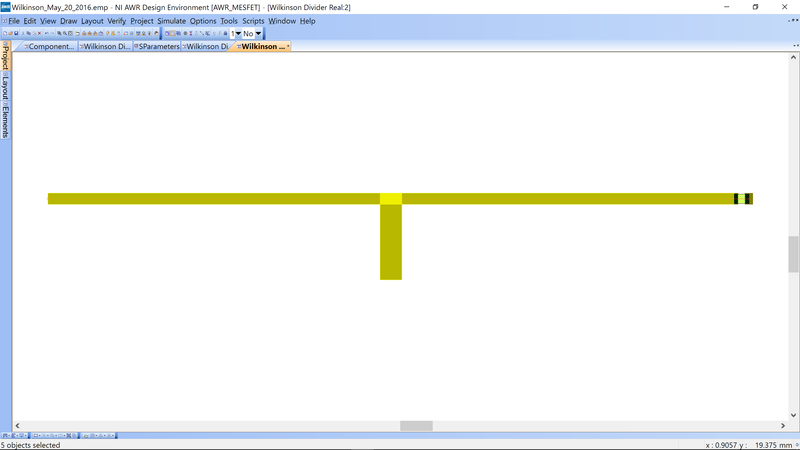 Click the right arrow – it will calculate the width and length to the line. 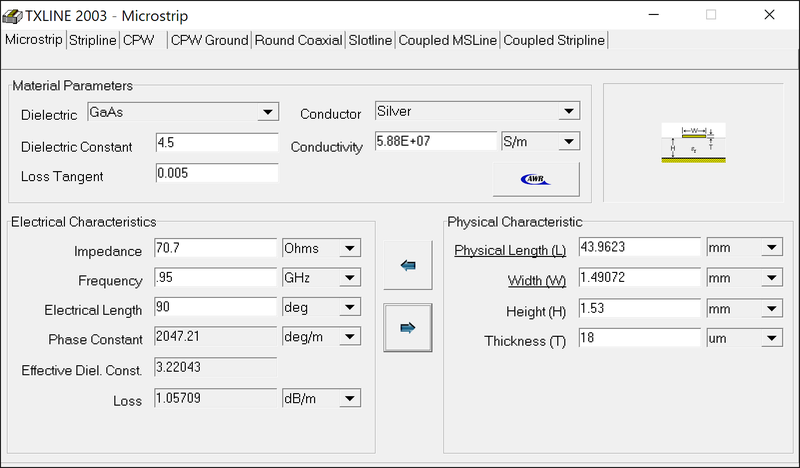 Likewise, if you change the Length or Width on the right side and click the left arrow, it will calculate the new Electrical Length and Impedance. 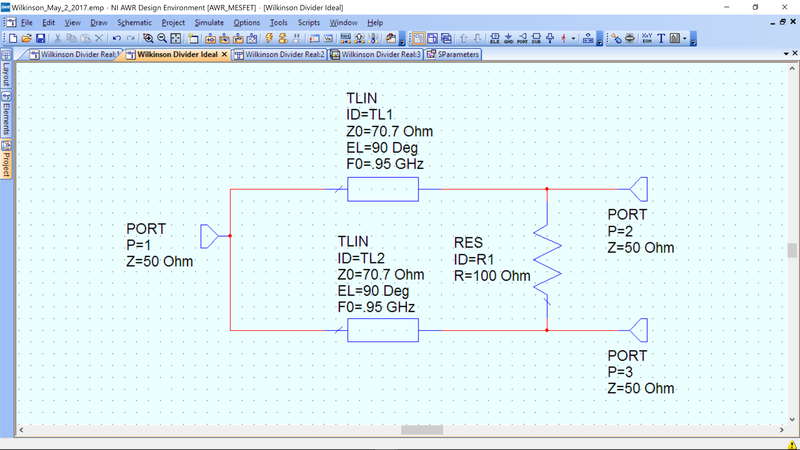 Return to your schematic and input the width and length of the transmisison lines you just solved for. Note: the TXLINE is an independent calculator. It can stay open while you work on your schematics. 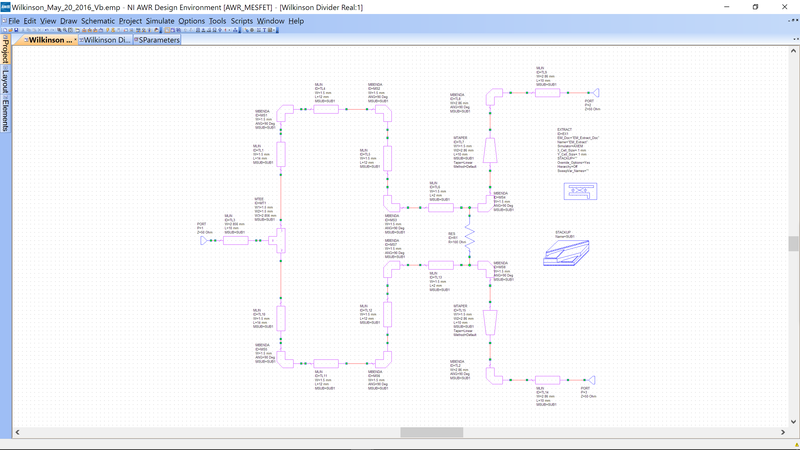 In addition it is not linked in any way to your schematics, so it doesn’t transfer any data – you must do this by hand. 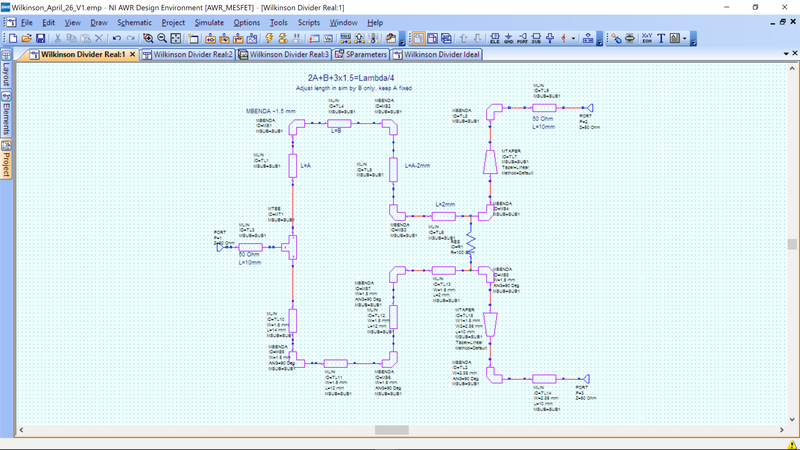 Simulate the combiner again with the real transmission line models. You should see a result similar to the one below, where “real” is using MLIN. As it is, it is not possible to layout the combiner as you cannot connect the resistor and tlines without putting them on top of one another. You can immediately see the problem – the two inputs are far away from one another and there is no way to connect the balance resistor to both ends. The corner pieces are MBENDA, where the A causes the bends to be mitered. We have placed 4 MLINs in series with 3 MBENDAs to replacec the single length of the original MLIN in one leg of the combiner. For example if your target length is 40 mm, you would A=15, B=5.5. Note that TL5 has A-2mm, however that 2mm is regained on TL6. TL5 and TL1 are different lengths to allow for the balance resistor layout, R1. 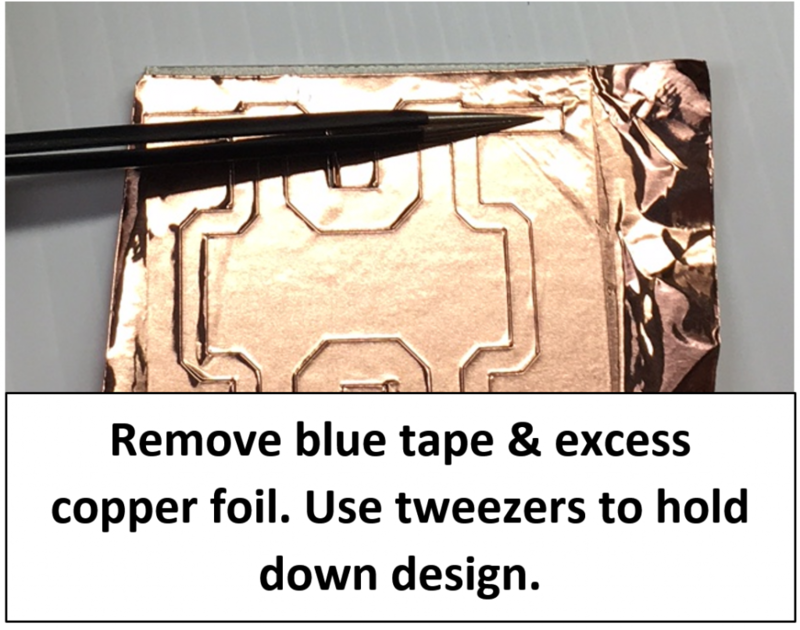 The PCB for the workshop is 2 in x 2 in, please design your Wilkinson to match these dimensions. The distance between the input and output SMAs should be exactly 2 in, please lengthen 50 Ohm feedlines so overall width is 2 in (50.8 mm). Dimensions may be adjusted by lengthening the 50 Ohm feed lines to either input. Also, as shown below, the distance between the two SMAs on the right side much match the branchline SMA spacing – exactly! After simulation your performance may not be exactly centered at your target frequency. You may adjust B length to change the length of the whole leg. Please keep A and A-2mm lengths the same, as they are needed to ensure the resistor will fit. In the above schematic we have also added the routing from the 50 Ohm ports (at least 10 mm). These 10mm lines will be used to connect to the SMA connectors and must be long enough to allow them to be soldered (they will be soldered directly onto the 50 Ohm lines. An MBENDA is uses to connect the combiner branch to a tapered line that will go from the 70.7 Ohm width to the 50 Ohm width. The component is called MTAPER and you simply enter the widths of the two MLINs it attaches to. Finally you can add some MBENDA and MLIN to route to the 50 Ohm ports. To layout, we recommend you do one branch first and then copy and paste it (in the schematic, the layout will follow the schematic). This way you only have to get one branch correct and then duplicate. To layout, go to the layout view, select all (CTRL-A) then Edit->Snap Together. Note: if the logical layout is not possible or there are multiple logical layouts, the snap together may not put pieces where you prefer them. You may have to do some manual adjustment, and when you are close, you can try snap again to get ot the final layout – note if it doesn’t snap correctly, it is likely as the layout you want is not possible, i.e. tlines may be on top of one another, etc. Also, the resitor does not snap, so you will place that manually. It is very helpful to use AWRs dual window format. 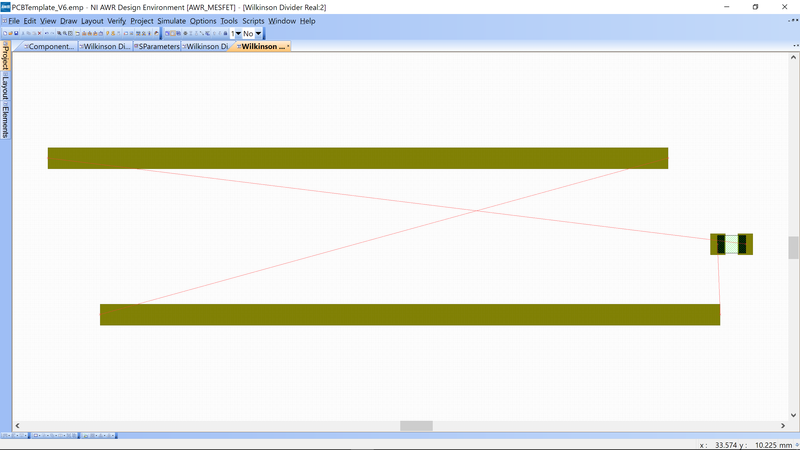 Simply close all windows but the schematic and layout, then Window->Tile Vertical and you will see a view like below. This way you can change the schemtic lengths and see the change in the layout immediately (you’ll need to snap at each schematic change). IMPORTANT FOR COMPLETE RADIO DESIGNS: The spacing between the two inputs of the Wilkinson should match the spacing on your branchline coupler. The mixers will mount between the branchline and Wilkinson and have a straight layout, so the SMA connector from the banchline needs to line up with the Wilkinson. Below is a picture of the complete radio (minus amplifier and oscillator). Note how the branchline and Wilkinson should align. It is easier to adjust the Wilkinson, than the branchline. The length of the tapers can be changed so that the spacing equals the same spacing as the output of the branchline. There is a measure tool icon in the layout tool bar at the top. Below is an example of a modified Wilkinson to match a branchline. Once added, you should select all of the transmission line elements in your schematic (you will have to click each, but you can hold down Shift to select as you click), right mouse click on selected group and select Properties. 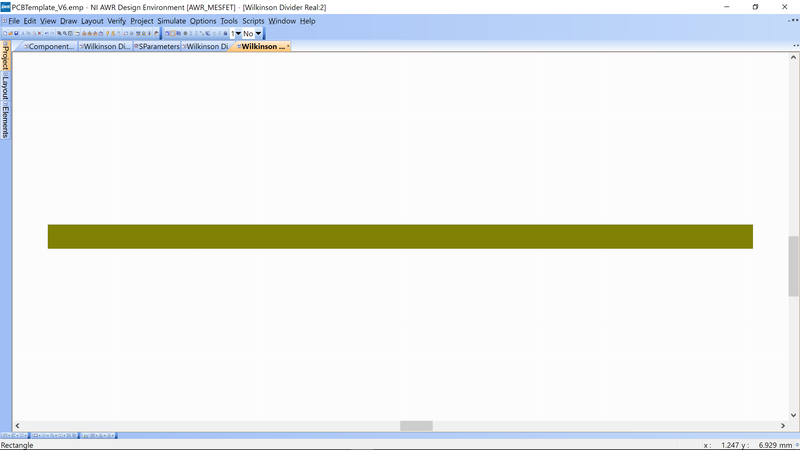 You cannot select all, as that will select lines and ports, which are not extracted. Also, the resistor does not have an EM model, so do not extract it. You will see a dialog box. 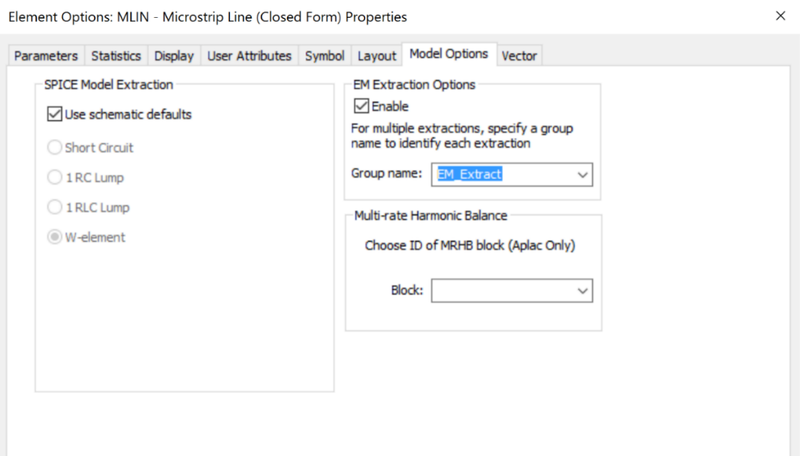 Select the tab Model Options and select Extract. See the figure below. NOTE: the resistor and ports are blue and are not extracted (there is not an EM model for them). 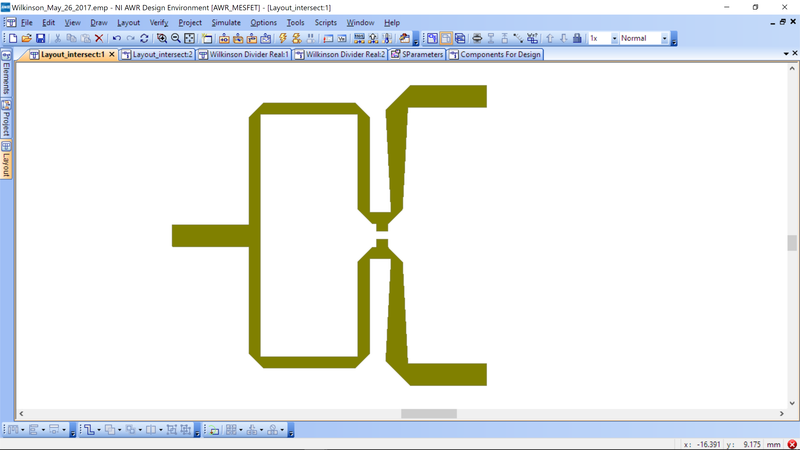 In the Extract component text (just double click directly on schematic), set the X_cell_size=0.3 mm and the Y_cell_size=.3 mm. 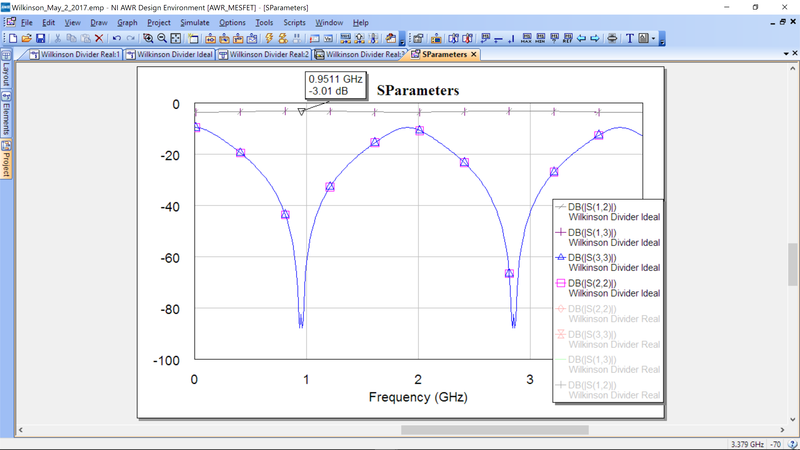 Then right mouse click on the Extract block, and go the the frequencies tab, set the EM simulated frequencies to .55 to 1.55 by .1 GHz steps. Make sure the Use Project Defaults is unchecked. 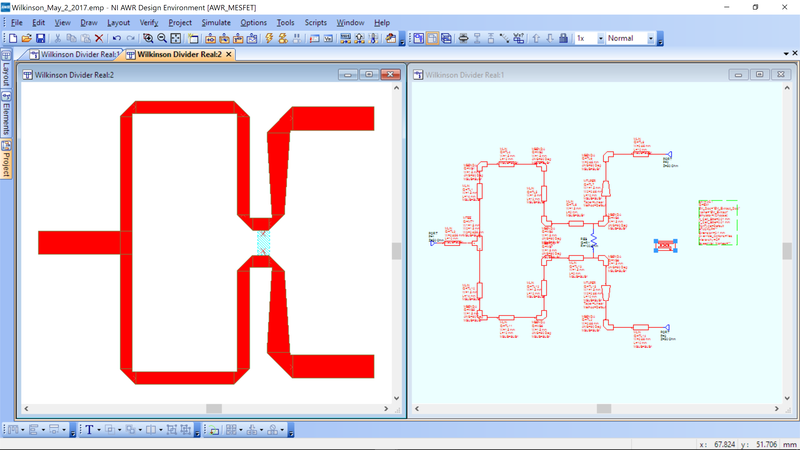 This allows you to run your EM simulation on fewer points for faster simulation. When using MLIN and straight layouts, very little difference will be seen. When using meander transmission lines, lines that are close to other strucutres and non-transmisison line conductors, eg. Ground plane, a significant difference can occur. Note: If your design does not simulate, it maybe that you do not have the layout connected everywhere. You can zoom in on each connection and ensure the connection is made. 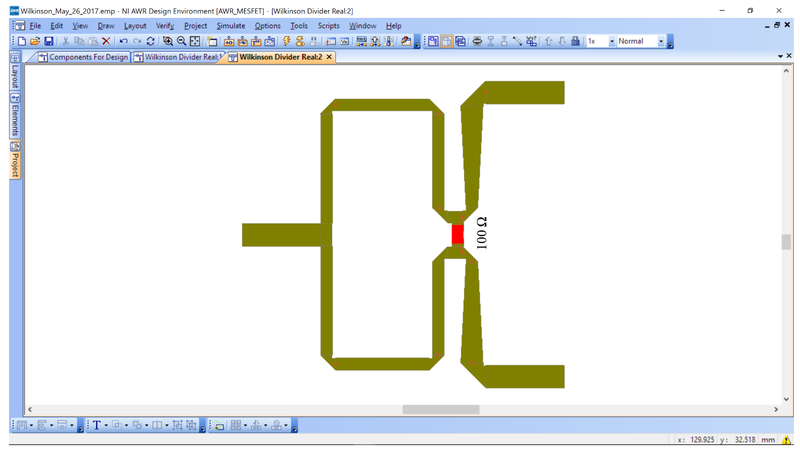 To make the file for the 2D cutter, create a new schematic called “Wilkinson Cutter”. Then go to View->Layout. You should see an empty layout. 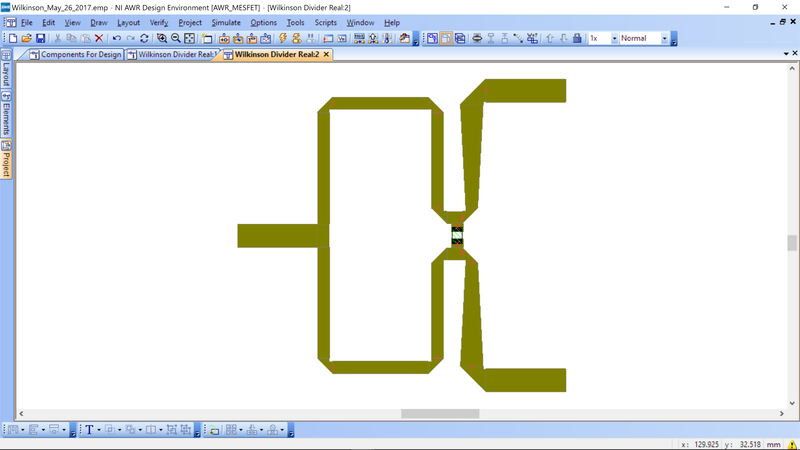 Go back to your Wilkinson layout, select all (Ctrl-A), then copy and paste into your layout window for “Wilkinson Cutter.” Now select all and in the lower left, select Union. This will connect all of the polygons in your layout together. Save your file with your name, e.g. Wilkinson_ricketts_V1.dxf. Take your file to the instructor or email your workshop directly, the organizer will give you the email for your SDC/workshop, e.g. ims2018@rickettslab.org, eumw@rickettslab.org, ieee_workshop@rickettslab.org. The instructor will provide you with your cut design. 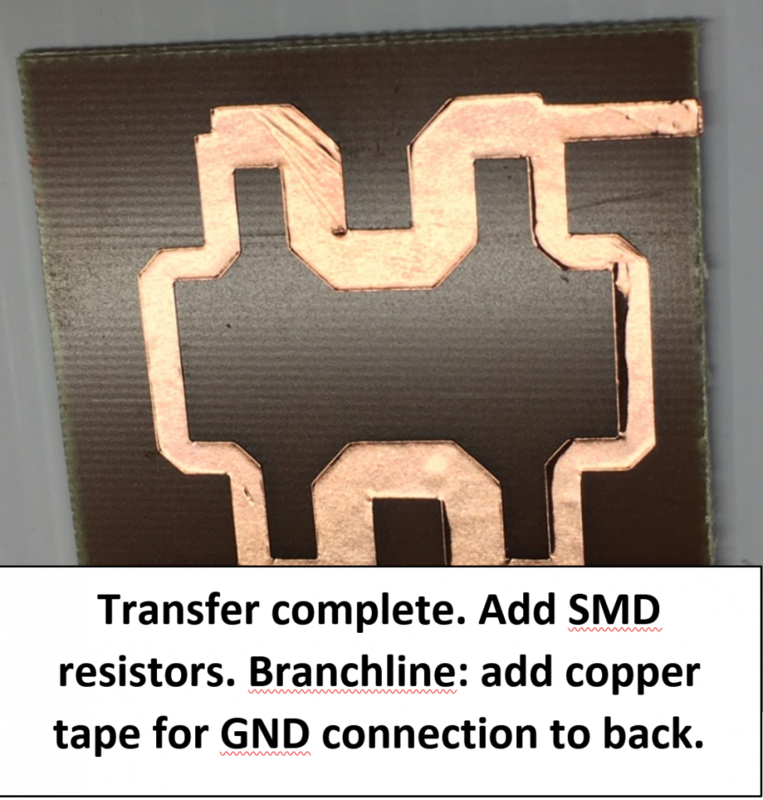 It can be transferred to a PCB as below. Solder on the 100 Ohm resistor. Note it has a similar color to the 50 Ohm resistor, however there are only 2 in the package for the 100 Ohm. Solder on the SMA connectors, ensuring they are straight. Breakoff the top-side pins to prevent interference of the pins with the transmission lines. See fabrication section/booklet. 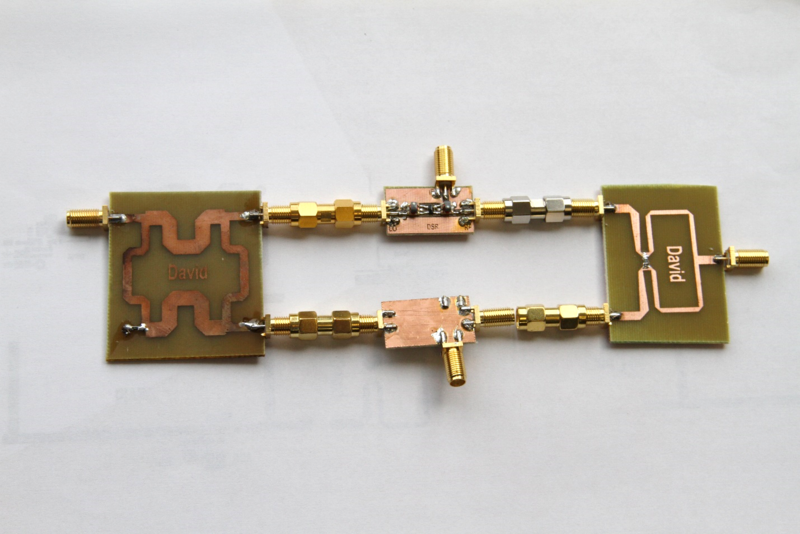 The Wilkinson combiner combines two signals into one, or splits one signal into two equal parts. It also keeps the input impedance matched while splitting/combining the power. Terminate one output of the Wilkinson combiner with a 50 Ohm termination and connect the VNWA Tx Out to the input and Rx In to the non-terminated port. The image below shows the two test configurations. Measure S11 and magnitude and phase of S21 using the VNA. Swap the terminated output and the output connected to the VNA. Remeasure. Your S21 should be around -3.5 dB and your S11 should be below -10dB, with a goal of less than 20 dB. There should be zero phase difference in the two output (or close to zero).